Pro Restoration, Inc. provides fast, expert repair and cleanup services in response to clogged drains, overflows and other plumbing disasters. Water damage from clogged drains and overflowing fixtures or appliances arrive with no advance notice. Suddenly you have massive amounts of water where it doesn’t belong. Quick, expert action is essential to protect your property, minimize damage and get life back to normal. Call Pro Restoration, Inc. or contact us online for sink overflow cleanup, toilet overflow cleanup, and other water overflow problems. 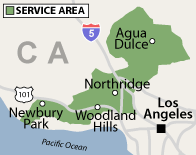 We work throughout the Greater Los Angeles County area, including Van Nuys, Woodland Hills, Westlake Village, Sherman Oaks, Canoga Park, and surrounding areas. A wide range of cleanup, repair and restoration work must often be performed in response to a clogged drain and water overflow problems. Pro Restoration, Inc. is equipped and ready to take on whatever type of water emergency you may be experiencing. If you live in or around the Pacoima, Granada Hills, Northridge, North Hills, Encino, Calabasas, Newbury Park area of California, contact us today to schedule an inspection and estimate for water damage restoration. The sooner you take care of the water problem, the better.